I went for a walk yesterday Monday and took these photos in the Emita Area or just off of Pilar or United Nations Street, in the general Area of Arquiza. 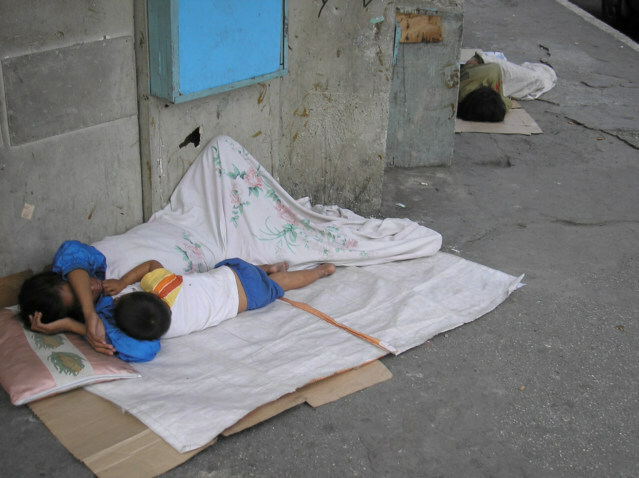 I first say this Street Children and I then waked down to the United Nations Street turned left and then went to what I think is Pilar Street, the Duck Inn is on this street and so is the LA Cafe... hehehe. After I turned down the street with the construction and the very nice chain called Mercury Drugs a great store in the Philippines, mixed up in the mess. Across the street or one one of the corners I nabbed a photos of people still sleeping. 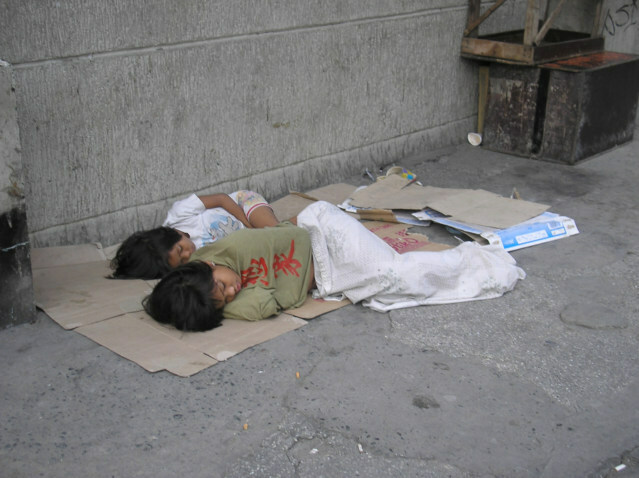 It was about 8:00 in the morning, the street will clear around 9:00 of the kids or parent, adult bums sleeping. The ones that pull on my strings is the mother and child team, this is annoying and the responsibility of the Philippines government, they try to way lay this to the tourist. Obviously the Children or Street Kids center is not completing the job or doing the job, this is less than one block for the place. 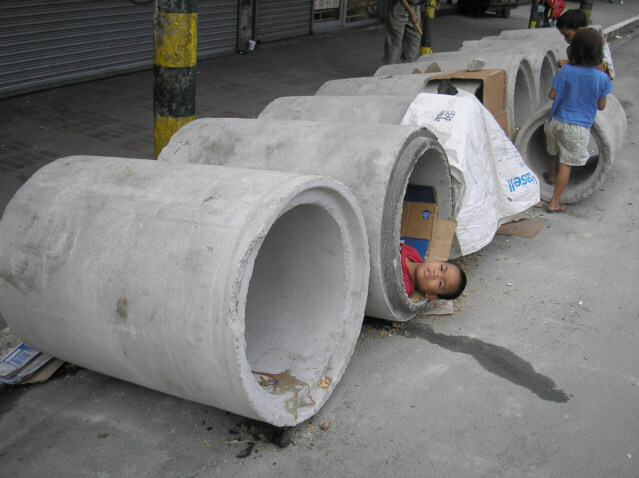 A funny picture this boy has slept in the construction concrete drain tiles for the night, he has a piece of cardboard inside to keep the cold off the skin and to make life more comfortable, his head is out and I think he about ready to get out of bed. 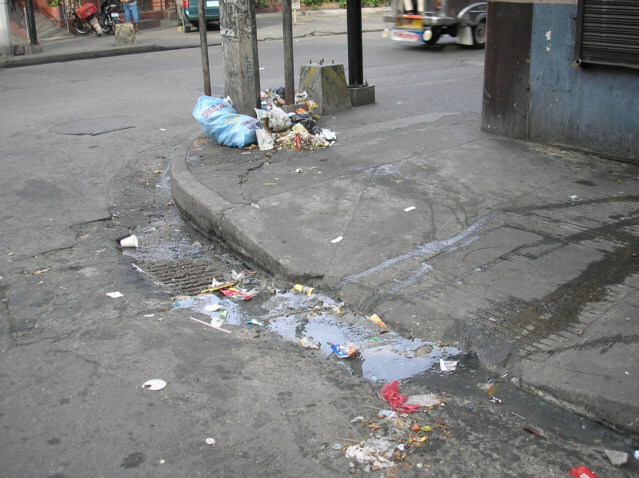 These clumps of garbage are like land mines in Manila, that and big holes in the street where for sure a child or adult could fall inside. They have these wheelchair ramps and this is hilariously out of place on a street or place where the persons are allowed to park on the sidewalks. The system here is something like this, everyone throw the trash in the streets, then the cleaning people sweep in the morning. Any city that puts out trash bins instantly is five times cleaner. I rate the development of a country many fold by the number of trash bins. In Manila or this part, it is hard to find, in the Makati area where 99 percent of the visitors to this city probably stay I would assume the Philippines would hide or disguise and have some. Religions are regulated by governments. Governments are regulated by religions. Philippines is one of the most primitive cultures, in primitive cultures men prove to other men they are strong by having babies. 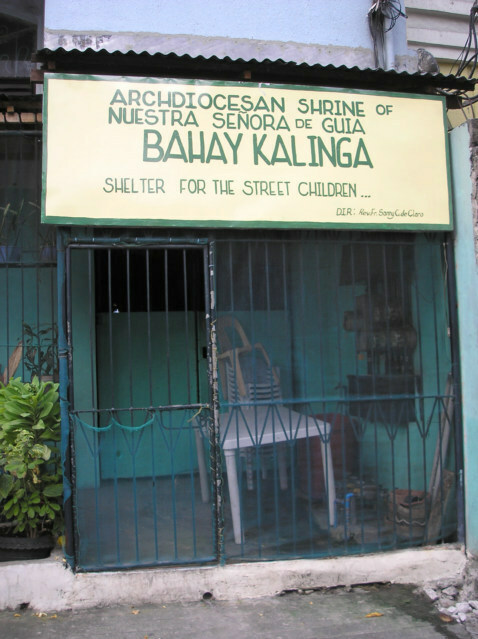 The Catholic Church wants more Catholics so they can dominate the world and get more money from the primitive Philippine people. Television is the solution, eventually the Philippines people will copy the people on Television and stop this primitive behaviour. A primitive culture believes that self-destructive behaviour is valuable, no connection between brain and behaviour. Shame is an incredibly powerful force in the Philippines and nobody uses it, by saying... hey you, you are being stupid by having babies.